I recently underwent 3100 fue procedure with Dr Armani in Dubai. I will get Hairsite to publish the photos since I can’t seem to myself. I am incredibly concerned about the potential yeild from my transplant having read all the posts from dissatisfied former Armani patients. I hope that my yeild is satisfactory, but it seems a long shot! At the moment, my native hair are growing through. 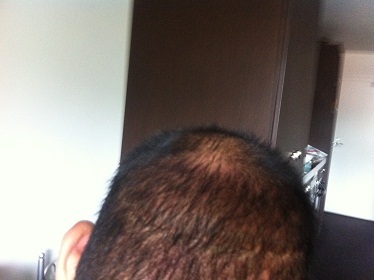 I have previous had 3400 strip done through Dr Poswal in India. 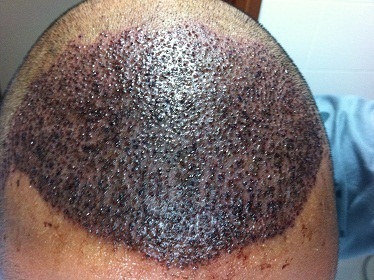 My current concerns are that there are a number of pimples in the hairline, especially in the corners of the hairline. I have been advised to put Fucidin H to help. 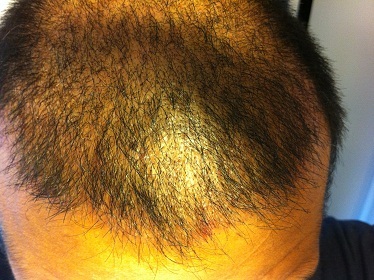 Also, the donor hair looks overtaxed. I go back to work next week and am really worried that people will be able to tell about my HT!! I have ordered some Demamatch to help cover it up since Toppik clearly stands out! At this point I wish I had another 2 months up my sleeve to rest so that my native hair could grow back to where they were preop and I could go back to using Toppik without a pimply hairline! I would appreciate your thoughts, views, and opinions. You sound like another guy on a hair transplant treadmill. This is what scares me about the whole deal with transplants. One you get on, there’s just no getting off until your donor hair is gone and your funds are depleted. What is your age btw and don’t tell me you are in your early 20s. 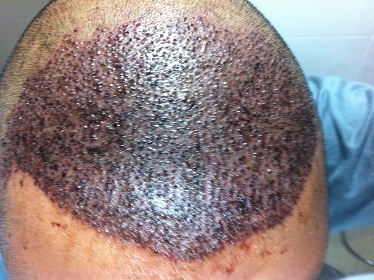 Are you on propecia/avodart + minox 5% + nizoral 2% and if not why? » You sound like another guy on a hair transplant treadmill. » What is your age btw and don’t tell me you are in your early 20s. 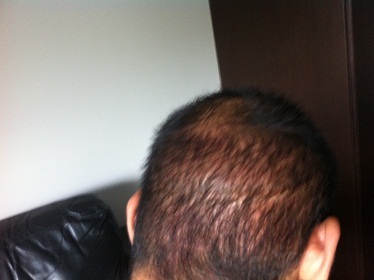 » Are you on propecia/avodart + minox 5% + nizoral 2% and if not why? Yes, it certainly feels that way. I’ve definitely decided that I won’t have any more transplants. I just hope my current one comes through alright. Actually, I would be happy for just the redness and pimples to go away and my native hair to come through since I was managing fine with that and a bit of toppik! All these horror stories I’ve been reading latelt about Armani have me stressed though. I will now wait for Histogen or another method to come to fruition. In case that does not happen and I start to lost all my native hair, then I will spend money on getting my strip scar filled in with beard hair or otherwise and keep my hair shaved down to #1. At the moment, I am left with the hope that the dermamatch I have ordered will help coverup my baldness. 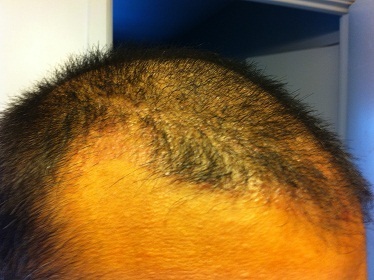 I would use Toppik, but with such little grow one month after shaving it all for the procedure Toppik stands out. I’m 33. 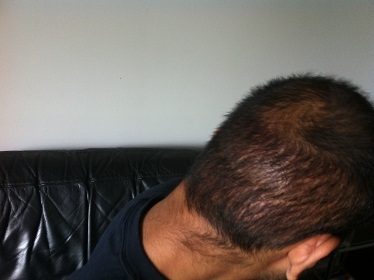 I’ve been on generic propecia for 3 years now (no side effects). Minox on and off, but will become consistent now. And do use Nizoral once a week. AK I would guess that 90%+ that are not happy with their hair transplant procedure do not post their experience. Even those that seem happy but have issues will not speak about it. I can’t even post many of the things I know from my own interaction with patients and through my own experiences with numerous doctors which spans dozens of years. It’s frowned upon and more often than not it does little good. Some patients are also in a position where they sign so many legal papers that they are prevented from speaking out. So they are unable to help others even if they wanted to. Why did you choose to change clinics to being with? You might not want to answer that, and I understand. This is why before you make that next move start speaking to patients and people in the industry on the phone or in person. Otherwise you will have only yourself to blame for any future decisions which turn out badly.